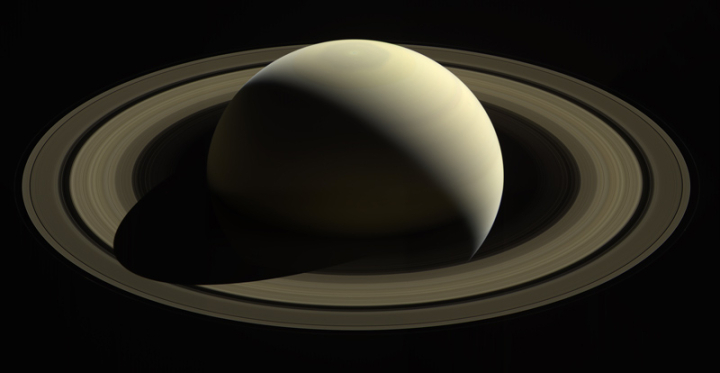 Using Cassini data of the rotation rate of Saturn’s rings, scientists have calculated what they think is the precise rotation rate of the planet itself. The answer, it turned out, was hidden in the rings. During Cassini’s orbits of Saturn, instruments examined the icy, rocky rings in unprecedented detail. Christopher Mankovich, a graduate student in astronomy and astrophysics at UC Santa Cruz, used the data to study wave patterns within the rings. His work determined that the rings respond to vibrations within the planet itself, acting similarly to the seismometers used to measure movement caused by earthquakes. The interior of Saturn vibrates at frequencies that cause variations in its gravitational field. The rings, in turn, detect those movements in the field. This work certainly seems ingenious, clever, and somewhat convincing, but I must admit I laughed when I read their estimate of the day length above, to the second. That is ridiculous. Their margin of error cannot possibly be that small. Mankovich has for sure narrowed the uncertainty in the length of Saturn’s day, but forgive me if I remain skeptical as to the precision claimed. The uncertainty of science: In a review of Cassini data from 2016, scientists have finally identified rain in the northern polar regions of Titan, signaling the onset of summer there. Though the data somewhat matches their climate models, those models did not predict the rain’s late arrival, which means they need revision. I guarantee that this will not be the last revision, though without an orbiter at Saturn it will probably be decades before we have new data to make that possible. Using data produced by Cassini while orbiting Saturn scientists have discovered long narrow stripes on the moon Dione. That they cut across the topography implies strongly that they were laid down from above, after the surface irregularities were created. The Cassini science team today released a mosaic of the last images Cassini took of Titan before it crashed into Saturn’s atmosphere four days layer. The mosaic shows Titan’s north polar region, and shows seas, lakes, and spotty clouds. The lack of clouds is a puzzle to scientists, as they had expected the north polar region to be cloud-covered at this time as summer arrived there, as had been seen at the south pole. 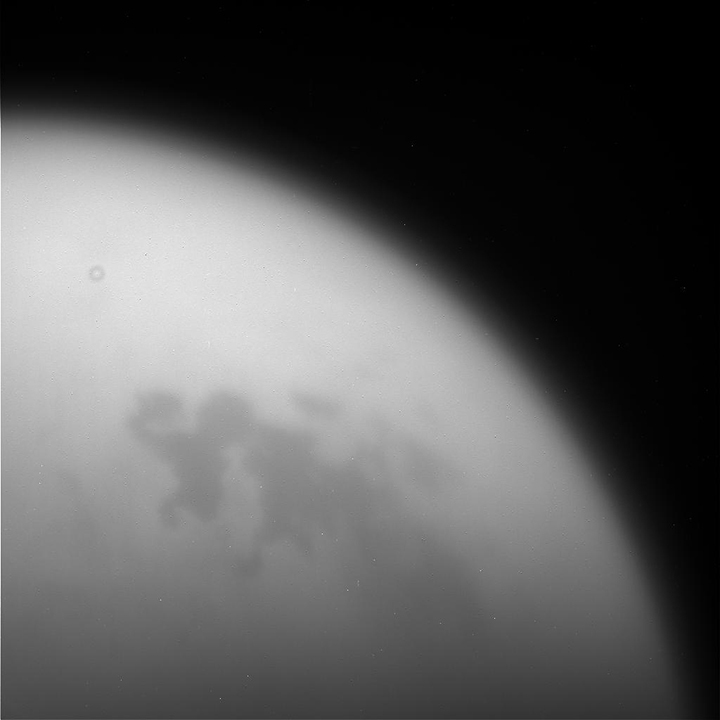 During Titan’s southern summer, Cassini observed cloud activity over the south pole. The truth is we haven’t the slightest idea whether the clouds over the south pole during its previous summer were normal or an aberration. We have barely seen a full year of seasons at Saturn and Titan. To confidently extrapolate any pattern from this slim data is silly. The Cassini science team today released global infrared mosaics of Titan, created from images accumulated during the more than 100 fly-bys of the moon during the spacecraft’s thirteen years in orbit around Saturn. The image on the right, cropped and reduced in resolution to post here, is only one such global mosaic. Go to the story to see them all. The uncertainty of science: New research has found that the methane that Cassini detected being released from Enceladus’s interior could conceivably come from at least one Earth-type microbe. Scientists do not really know the precise conditions on Enceladus yet, of course. And in any case it is possible any life there, if it exists, is nothing like any DNA-based organism on our planet, rendering our Earth-based extrapolations moot. What’s more, these findings only show microbial life might exist in one particular subset of possible environments within the moon’s dark ocean. This result is interesting, but it really proves nothing about Enceladus itself. 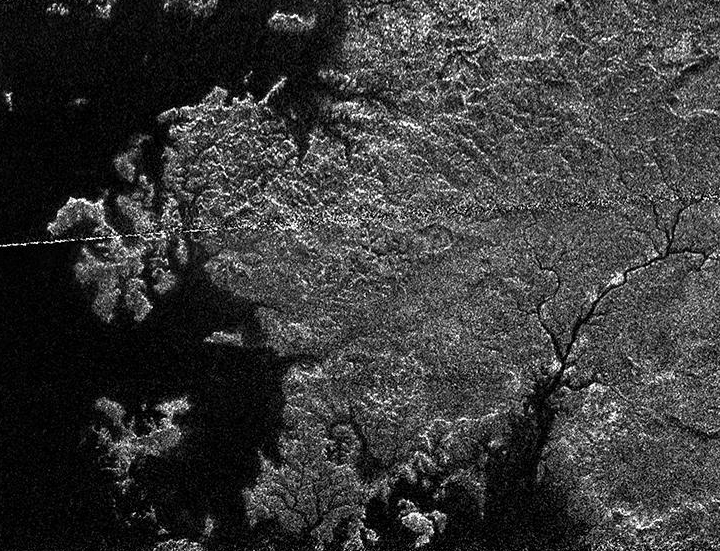 New research using Cassini data has revealed that the liquid hydrocarbon oceans of Saturn’s moon Titan have a global sea level, with some small lakes perched at higher elevations. Data from Cassini’s last ring-diving orbits has now strengthened the hypothesis that Saturn’s rings formed very recently, just a few hundred million years ago. Saturn acquired its jewels relatively late in life. If any astronomers had gazed at the sky in the time of the dinosaurs, they might have seen a bare and boring Saturn. At the moment there is no consensus on what might have caused the rings formation so recently. Cool image time! The image above, cropped and reduced in resolution to show here, was created by Cassini from 42 images taken on September 13, 2017, two days before the spacecraft dived into Saturn to end its mission. Be sure to take a look at the full image. It shows six of Saturn’s moons, as well as many stars. Cool image time! The image on the right, reduced in resolution to post here, was taken by Cassini on August 17, 2017, one month before the spacecraft dived into Saturn to end its mission. The moon Pandora can be seen in the full resolution image just beyond the outermost ring near the top of the screen. The spacecraft’s Ion and Neutral Mass Spectrometer (INMS) returned a host of first-ever direct measurements of the components in Saturn’s upper atmosphere, which stretches almost to the rings. From these observations, the team sees evidence that molecules from the rings are raining down onto the atmosphere. This influx of material from the rings was expected, but INMS data show hints of ingredients more complex than just water, which makes up the bulk of the rings’ composition. In particular, the instrument detected methane, a volatile molecule that scientists would not expect to be abundant in the rings or found so high in Saturn’s atmosphere. The results generally leave behind more questions than answers, but that is exactly why exploring the universe is so much fun. A new climate model for Titan that suggests the planet’s methane rainstorms occur about once a Saturn year (29.5 years) and at about 60 degree latitude correlates with Cassini surface data that found a high concentration of alluvial fans at that latitude. Sean Faulk, a UCLA graduate student and the study’s lead author said the study also found that the extreme methane rainstorms may imprint the moon’s icy surface in much the same way that extreme rainstorms shape Earth’s rocky surface. On Earth, intense storms can trigger large flows of sediment that spread into low lands and form cone-shaped features called alluvial fans. In the new study, the UCLA scientists found that regional patterns of extreme rainfall on Titan are correlated with recent detections of alluvial fans, suggesting that they were formed by intense rainstorms. The scientists who used Cassini to identify about 60 transient clumps in Saturn’s rings have dubbed them “kittens” and have been naming them appropriately. Saturn’s kittens are a group of small clumps and baby moons, or moonlets, that occupy the planet’s F ring. Like the rest of Saturn’s rings, this thin outer ring is made up of countless particles that range in size. When enough of those particles bump into one another and stick together, they aggregate into larger clumps — and become eligible for a kitten name. So far, the list of Saturn’s kitten names includes several classics, like Fluffy, Garfield, Socks and Whiskers. These are unofficial nicknames for more-complicated (and less adorable) official titles like “Alpha Leonis Rev 9” (aka, Mittens). 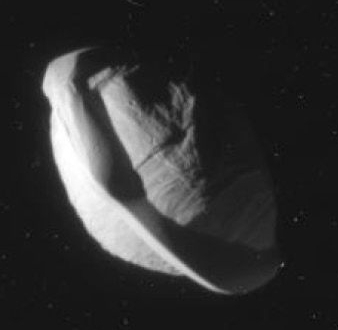 The technical names for these features come from events called stellar occultations, during which Cassini was able to detect the little clumps. In a stellar occultation, a star passes behind Saturn’s rings from Cassini’s point of view. Most of these clumps will likely never be found again, so their unofficial kitten names are essentially just for fun. 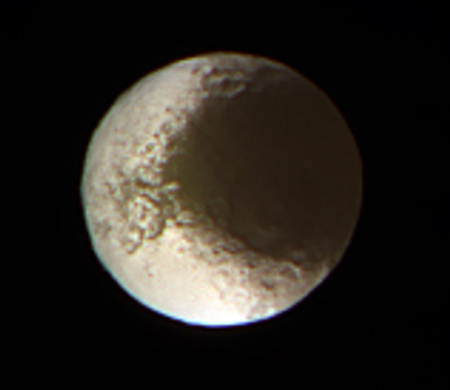 The image on the right is a cropped and scaled up version of one of Cassini’s last images of Saturn’s moon, Iapetus. The moon is unique in that its east and west hemispheres have completely opposite albedos, with one being very dark and the other very bright. It also has a very distinctive large crater, seen in this image. Scientists do not quite understand what causes the dichotomy, though they have models that partly explain it, partly from material being deposited on the moon’s leading hemisphere combined with the temperature differences at different latitudes. The cause of the extreme brightness dichotomy on Iapetus is likely to be thermal segregation of water ice on a global scale. Thermal effects are usually expected to act latitudinally. That is, polar areas are colder than equatorial terrain in most cases due to the more oblique angle of the solar irradiation. Therefore, an additional process is required to explain the longitudinal difference as well. In one model, dark, reddish dust coming in from space and preferentially deposited on the leading side forms a small, but crucial difference between the leading and trailing hemispheres, which is sufficient to allow the thermal effect to evaporate the water ice on the leading side completely, but only marginally on the trailing side. It was this moon’s strange dichotomy that had Arthur Clarke use it in 2001: A Space Odyssey. While Cassini’s images clearly prove that the brightness difference was not created by an alien civilization, as imagined by Clarke, those images have not really provided us a full explanation for its cause. The uncertainty of science marches on! After a seven year journey and thirteen years in orbit around Saturn, Cassini’s mission ended early this morning with a dive into Saturn’s atmosphere. The image above, cropped to show here, is actually one from a short movie, showing Enceladus setting behind the horizon of Saturn. The images were taking two days ago, but provide a fitting image for the mission’s end. Some of the best images from the dive, including Cassini’s last image, can be found here. While most of the press will rightly wax eloquent about the magnificence of this mission, my focus remains on what will come next. We no longer have any way to observe what is happening on Saturn. We are blind. We should not be. The Cassini science team has released the spacecraft’s last shot of Titan, taken during its last fly-by of that moon of Saturn on September 11, 2017, and posted below. Engineers have confirmed that Cassini is now on its final approach to Saturn, with a scheduled dive into the gas giant set for Friday, September 15. We will get Cassini’s last images about 90 minutes after its death. Link here. Those who have read my book on the building of the Hubble Space Telescope will recognize many of the same people and political maneuvers used to get the project off the ground and funded. Note too that the idea of Cassini was first proposed in 1982, but it didn’t actually launch until 1997. Fifteen years. While today I think such a spacecraft could go from concept to launch much faster, this timeline gives us a guide on when the next Saturn orbiter might launch. At the earliest do not expect another mission to Saturn to launch before 2025. Cool image time! 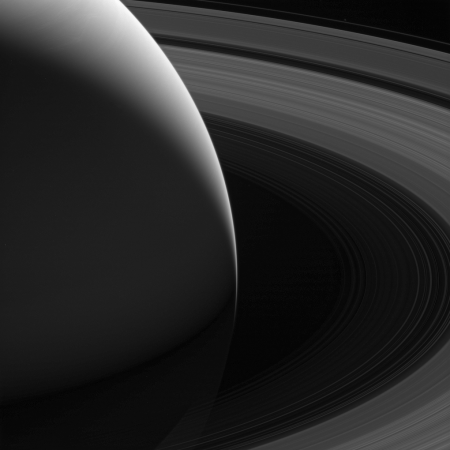 The picture above, reduced in resolution to show here, was taken in October 2016 during one of Cassini’s last distant orbits that gave it a global view of Saturn and its rings. Since it began its dives close to the gas giant such views have not been possible. The mission ends this coming Saturday with a dive into Saturn. It was launched in October 1997, and after a seven year journey has spent the last thirteen years in orbit around the planet, providing us the first long term glimpse of a gas giant as its seasons evolved. When the spacecraft arrived at Saturn in 2004, the planet’s northern hemisphere, seen here at top, was in darkness, just beginning to emerge from winter (see Cassini’s Holiday Greetings​). Now at journey’s end, the entire north pole is bathed in the continuous sunlight of summer. 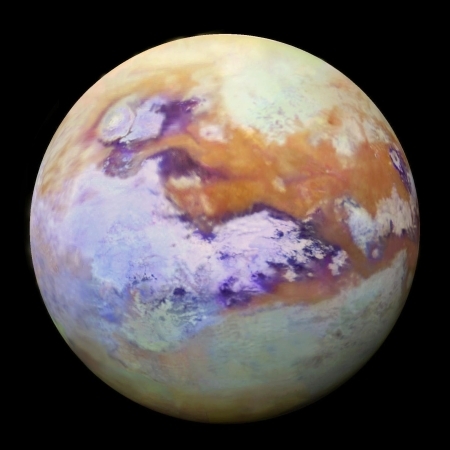 The spacecraft was also able to observe the seasonal changes that occurred to Titan. It also studied the plumes coming from the tiger stripe cracks on Enceladus, shown below the fold in a movie created by Cassini over a 14 hour time period in August 2017. I expect that scientists will be exploring Cassini’s data archive for decades, finding many things not noticed in their initial viewing. Unfortunately, we will not have another spacecraft taking new pictures in orbit around Saturn to compare with Cassini’s past images for many decades to come. On Saturday, we go blind. The Cassini science team released two sets of images taken by the spacecraft of Saturn’s rings. The pale tan color is generally not perceptible with the naked eye in telescope views, especially given that Saturn has a similar hue. 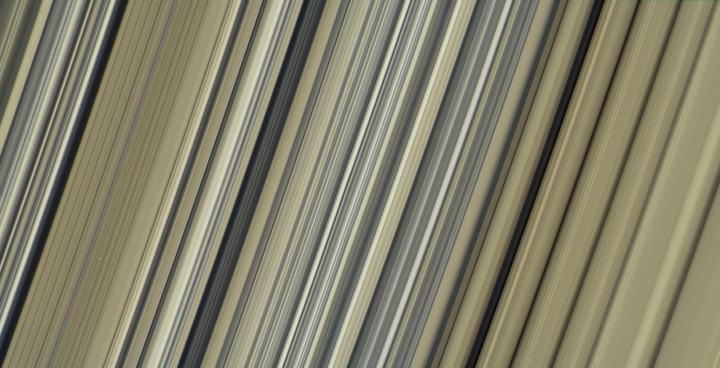 The different ringlets seen here are part of what is called the “irregular structure” of the B ring. Cassini radio occultations of the rings have shown that these features have extremely sharp boundaries on even smaller scales (radially, or along the direction outward from Saturn) than the camera can resolve here. 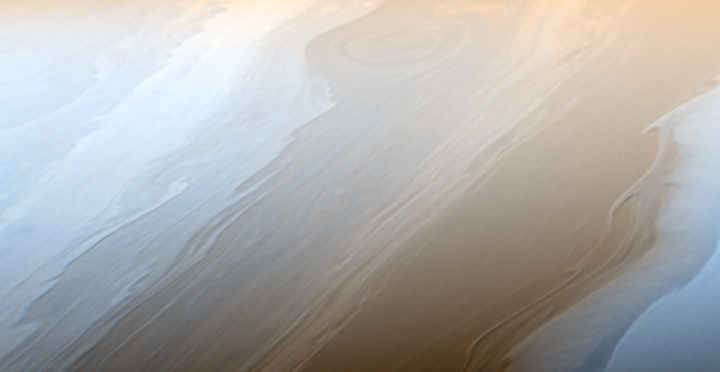 Closer to Saturn, the irregular structures become fuzzier and more rounded, less opaque, and their color contrast diminishes. Check out both. They reveal to me that our understanding of these rings remains essentially nil, even after more than a dozen years of study by Cassini. Cool image time! The Cassini science team has assembled a short movie from 21 images taken by the spacecraft during its August 20th dive between the rings and Saturn. That animation is to the right. Only two weeks remain in the Cassini mission. The spacecraft dives into Saturn on September 15. The second link above gives a detailed moment-by-moment breakdown of the final six days. I would have posted this earlier this week, but my limited internet access made it impossible. Sorry about that. Cool image time! The Cassini image above, cropped and reduced slightly, shows a close-up view of Saturn’s cloud tops, taken during Cassini’s May 18, 2017 fly-by. Clouds on Saturn take on the appearance of strokes from a cosmic brush thanks to the wavy way that fluids interact in Saturn’s atmosphere. Neighboring bands of clouds move at different speeds and directions depending on their latitudes. This generates turbulence where bands meet and leads to the wavy structure along the interfaces. What I see is a much less turbulent storm pattern, when compared with Jupiter. This is not to say that the weather of Saturn is quiet or peaceful, for it certainly cannot be, considering the gas giant’s size and the depth of the atmosphere. Still, this image suggests that the turbulence is less violent here, possibly because Saturn is farther from the Sun and is hit with less solar energy, and because Saturn is smaller and thus produces less of its own internal energy. Either way, it is beautiful and mysterious, in the way are all such images of alien places. The Cassini science team has released the last radar swath that the spacecraft will take of Titan, imaged on April 22. You can see the full swath up close here. The image above is my crop of the section on the swath’s right portion, showing the shoreline of the hydrocarbon lake Ligeia Mare, where periodically an island has been seen by radar to intermittently appear and disappear. No “island” feature was observed during this pass. Scientists continue to work on what the transient feature might have been, with waves and bubbles being two possibilities. The fly-by also took the first, and last, depth measurement of 8 other lakes, finding that they all had the same depth, suggesting they are connected by an underground “water” table. In this case, it ain’t water, but liquid hydrocarbons like methane. Cassini is about to begin its last of five orbits of Saturn, before it is sent into the planet’s atmosphere to burn up. Cassini will make the first of these five passes over Saturn at 12:22 a.m. EDT Monday, Aug. 14. The spacecraft’s point of closest approach to Saturn during these passes will be between about 1,010 and 1,060 miles (1,630 and 1,710 kilometers) above Saturn’s cloud tops. Cool image time! The image on the right, reduced in resolution to show here, was taken by Cassini in May and looks down at the outer rings of Saturn. The moon Prometheus can also be seen in the large gap between the main rings and the outermost F ring. The image clearly shows the gravitational influence of the moon on the outer ring. 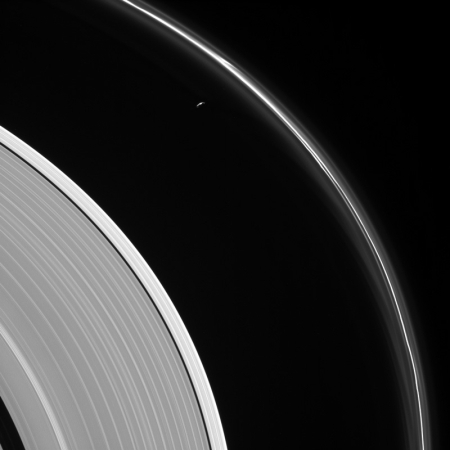 As Prometheus orbits past the F ring its mass creates waves through the ring’s materials.